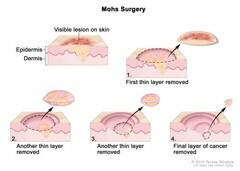 Mohs surgery; drawing shows a visible lesion on the skin. The pullout shows a block of skin with cancer in the epidermis (outer layer of the skin) and the dermis (inner layer of the skin). A visible lesion is shown on the skin's surface. Four numbered blocks show the removal of thin layers of the skin one at a time until all the cancer is removed.